Follow our 15 part cashing in with audio and video series to discover how to harness these simple techniques to drive website sales through the roof. Harness The Power Of Online Audio & Video And Generate Huge “Cash Surges” Any Time You Want! If You’re Tired Of Mediocre Sales Numbers, Your Life Is About To Change Forever! Video Is Making More Millionaires Than Anything Else Online! Does your website produce the kind of response that you need to stay afloat? Are you experiencing problems in cash flow even though your website does get traffic? Would you like to learn how you can harness the power of online video and audio and use it to make tons of cash from your website? If you answered yes to any of these questions, you are not alone. There are a ton of people out there that are suffering from the same problems (including me at one point) but you don’t have to go through this anymore…. If you’re looking for a way to not only increase profits in your business but also create new products in extremely easy fashion, this is exactly what you’ve been looking for. Never before has it been so easy to inject cash into your business then it is with the use of online video. If you can learn how to use this awesome technology, you have the power to literally double or triple your business over night. But that’s only if you know how to do it right. I’m going to share all of those secrets for maximizing your benefits with online audio and video in this letter. …Audio & Video Have Literally EXPLODED On To The eBusiness Scene! The technology just wasn’t up to snuff to make it easy and high quality enough to make an impact on the visitors. Not as many people had broadband as they now do so it would take forever for any audio or video to even load. But after sites like YouTube, Google Video, Yahoo Music, Real Rhapsody, etc came on to the scene and made online video and audio common place, this all changed. These big companies developed the technology that made video and audio easy to create and deliver to people on the Internet. Online Business Owners All Over The Planet Have Started Exploiting Audio & Video For Obscene Conversions, Profits & Sales Numbers! Obviously you’ve seen the tons of website that are using the power of video in their sales letters, products, websites and possibly even e-mails. The reason is because Audio & Video sell! People on the Internet want multimedia. Broadband Internet connections are easy to get an tons of people have them now so they want video, audio and interactive content. If you can give people this, you will be light years ahead of your competition. You’ve probably seen things on salesletter like video testimonials or demos of products that just make you that much more interested in buying the product. It’s a fact, video and audio convert more visitors into subscribers, purchasers and lifelong customers so it only makes sense to use them in your business. 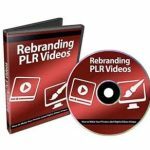 Is It Really Possible For A Complete Novice To Leverage The Power Of Online Audio & Video For Profits? You can see triple or even quadruple your current conversions!! You can WOW your customers like they never expected! You can use video and audio online without being a computer scientist! 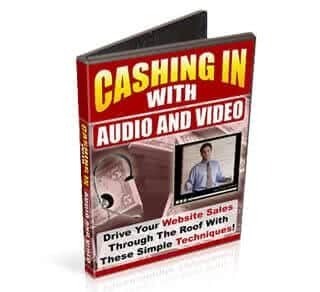 Using Video & Audio For Profits Online Has Never Been This Easy! In the “Cashing In With Audio and Video” Multi-Media video course you will learn exactly what steps you need to take to start implementing video in your business today. Everything has been stripped of all the techy language possible and distilled down to the essence of what you need to know. If it wasn’t necessary, we took it out. If it was necessary, we made it simple. You really can’t go wrong with this course because it’s loaded with all the tips you need to get started right away and free of all the fluff, clutter and “flim flam” that other courses have. Video Product Creation Tips A 5th Grader Could Do! – You will learn how you can leverage the power of video to create hot products that sell like crazy without being a video engineer or having any technical knowledge! Awesome Audio Tricks – This one section alone has made tons of marketers a fortune just by implementing a few strategies contained here. You will learn where audio performs best and how to put it in place quickly. First Hand Profit Clinic – Here you will not only hear about all of the success stories out there that revolve around the use of audio and video but you will see them all first hand! Just sit back and relax as you tour sites using audio & video effectively and profitably for your own ideas! Creating Recurring Income With Audio/Video – You will learn how you can create recurring income streams that you can count on like clockwork every month using the power of audio and video. How? You’ll have to tune into this session. The Blog Blisterer -I’m sure that you’ve seen the wave of bloggers using audio and video on their websites but in this section you are going to learn the “do’s” and the “don’ts” surrounding doing this as well as how to do it for maximum profit! The Sound Of A Squeeze – This ingenious technique will show you how to can use audio and video in a unique way to build a huge subscriber base that you can mail and profit for the rest of your life! Response Rocket – you can use audio and video to take a site that isn’t converting or that you would like to increase sale on and do it in a jiffy. You don’t have to be a high paid copywriter to use this tactic! I probably don’t need to tell you that the value in this cashing in with audio and video interactive video course is incredibly high. There are courses that don’t give you nearly as much quality information as the “Cashing In With Audio and Video” all over the Internet. Now that you see the power of audio and video and know that this amazing cashing in with audio and video course can help you start using video for huge profits right away, you can take action.